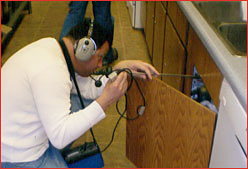 Precision Utility Locating is committed to quality accurate results. The value of using our company is that we have a clear understanding of quality expectations. This is the foundation of who we are. 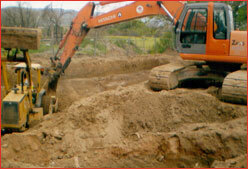 With years of construction experience, we have greater control over the entire locate process from underground utility locating to leak detection. An accurate job eliminates confusing extra work and extra financial stress on the project. We operate under the highest industry standards of the National Utility Locating Contractors Associations Standards, and we are Members of Common Ground Alliance. Experience and using advanced technology are the keys to our success. As the tools of our trade are ever evolving and with technology playing a greater role in the locating process, we are constantly changing our technical strategies and equipment to match the needs of your project. And we integrate technology with communication into a process that ensures everyone involved with the project is informed of the results. Precision Utility Locating services range from locating underground utilities, cables, pipes and drums to assisting law enforcement with finding buried evidence. We also provide leak detection for major infrastructure, commercial and residential projects, swimming pools, and fire and irrigation systems. Though most of our customers are in Central and Northern Arizona—Phoenix, Scottsdale, Mesa, Tempe, Tucson, Flagstaff, Sedona, Prescott, Prescott Valley and Chino Valley—we can provide service throughout the United States and assist with disaster recovery worldwide. 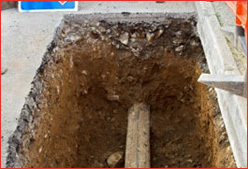 For more information, visit Underground Utility Locating and Leak Detection Services. 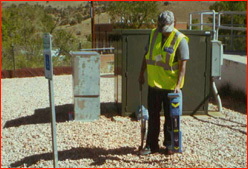 Precision Utility Locating School offers classes to become a Certified Utility Locator either at our Arizona facility or your site. This comprehensive 40-hour course meets National Utility Locating Contractors Associations Standards and Common Ground Alliance best practices. Learn more at Certified Utility Locator Training. Our Leak Detection Training Program is one of the few in the country. Learning these skills may provide you with a lucrative career, detecting leaks in residential and commercial buildings as well as an introduction to swimming pool leaks. Learn more at Leak Detection Training. Our comprehensive Swimming Pool Leak Detection Training will enable you to respond with confidence to commercial and residential pool leaks. You will learn strategies needed to be successful at finding pool leaks. 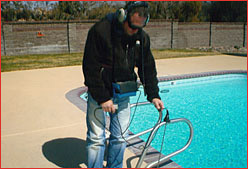 Precision Utility Locating is the premier provider of swimming pool leak detection education in the world. Learn more at Swimming Pool Leak Detection Training. We now offer an additional program, Underground Slab Leak Detection Training, to increase your knowledge and grow your business. As with all of our training, you'll receive hands-on instruction so you're comfortable with your skills when you graduate. Slab leak detection requires a special understanding of the types of equipment and a variety of solutions you will need to be effective in the field. 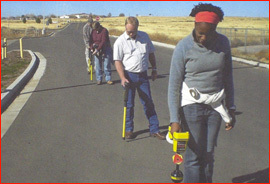 Learn more at Underground Slab Leak Detection Training. Precision Utility Locator welcomes trainees from around the world. Students from Canada and the Republic of Panama have completed claases and graduated from our school. Please email us for information.